President Donald Trump and first lady Melania Trump on the tarmac during their arrival on Air Force One at Glasgow Prestwick Airport in Scotland, July 13, 2018. Secretary of State for Scotland, United Kingdom, David Mundell, second from right, greeted them. FILE - Republican presidential candidate Donald Trump poses for the media during the third day of the Women's British Open golf championship on Trump's Turnberry golf course in Turnberry, Scotland, Aug. 1, 2015. Trump has long professed a special connection to Scotland, the land of his mother’s birth. 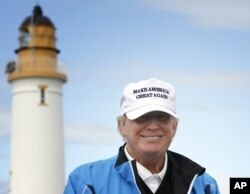 He owns two championship-level golf resorts in the country, including the seaside Turnberry. But since he ventured into Scotland a dozen years ago, Trump has been losing money and waging battles with longtime residents, wind farms and local politicians. David Milne, whose property overlooks Trump International Links, planned to mark the president’s visit the same way he did the last time Trump appeared: flying the Mexican national flag over his house within sight of the clubhouse to protest Trump’s hard-line immigration views. 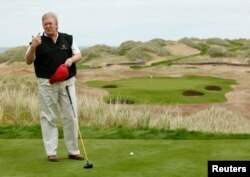 FILE - Donald Trump gestures as he stands at the 13th tee of his new Trump International Golf Links course on the Menie Estate near Aberdeen, northeast Scotland June 20, 2011. While Trump likes to brag about the properties — during a press conference at the NATO summit in Brussels he called Turnberry “a magical place” — they’ve also been losing money. A financial report filed by Trump’s company with the British government last year showed it had lost millions of dollars on the two properties and losses had more than doubled in 2016 to 17.6 million pounds ($23 million). It was the third year in a row of losses. Revenue also fell sharply. 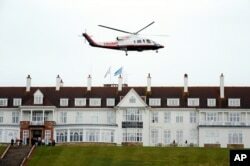 FILE - Presidential contender Donald Trump leaves by his helicopter on the third day of the Women's British Open golf championship at the Turnberry golf course in Turnberry, Scotland, Aug. 1, 2015.